Turning small family cars into dual-personality performance machines is nothing new. The longevity of the Volkswagen Golf GTI proves the veracity of the whole idea. Yet, inevitably, there are those who want to prove they can do it even better. We’re all used to the concept of the BMW M3 and, later to the game, the Audi RS4, but the smaller sub-genre is more recent – and a real game changer. 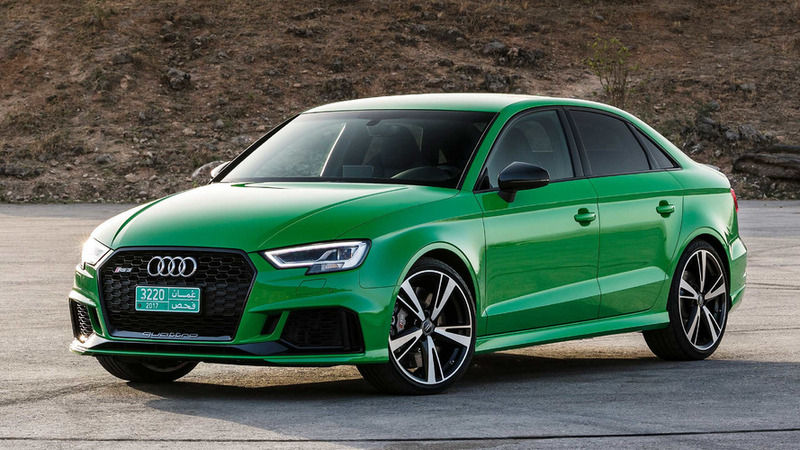 The Audi RS3, BMW M2 and Mercedes A45 AMG boast the sort of power and performance that recently was only the domain of much more expensive models. While it’s not necessarily hard to make smaller, lighter cars really fast, keeping them on the straight and narrow is more of challenge. Electronics has fixed all that. 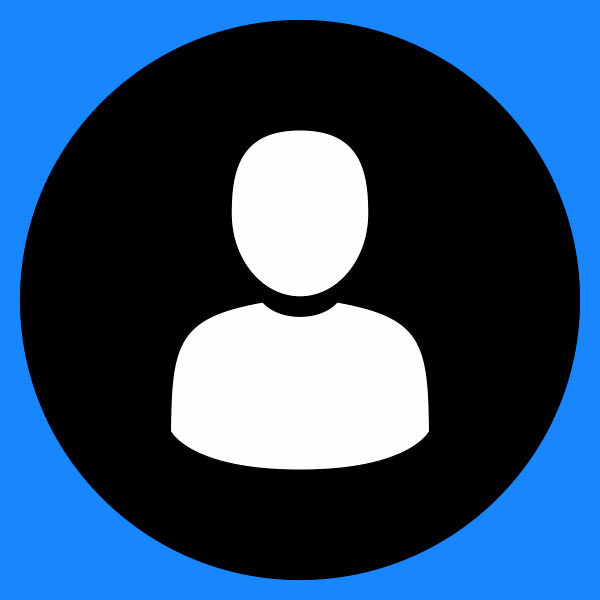 Welcome the new pretenders. This latest RS3 is largely the 2015 model with improvements – plus the opportunity, for the first time, of a saloon as well as the Sportback. So there’s the 2.5-litre five-cylinder turbocharged engine, with an additional 33-horsepower, quattro four-wheel drive and 7-speed S tronic double clutch transmission. Thus the new 400-hp RS3 beats the M2’s 370-hp and the A45 AMG’s 381-hp, at least until BMW and Mercedes go for their next upgrade. 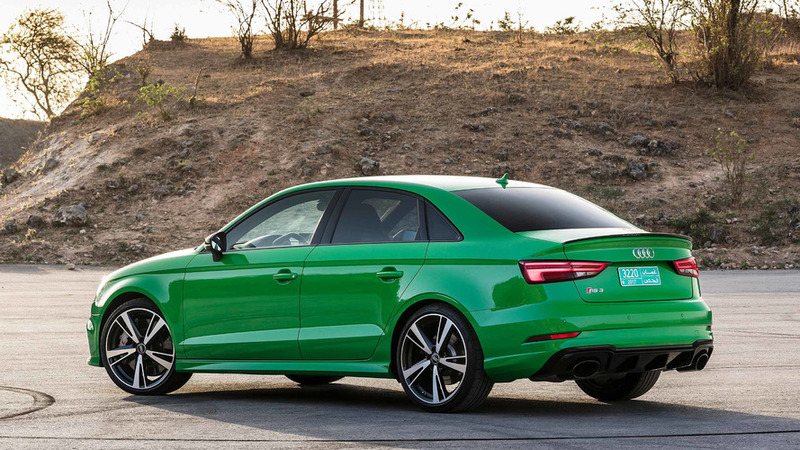 Already a very well judged design, in RS3 guise the A3 is visually outstanding. The black chrome detailing gives a subdued, almost sinister look, while the Titanium pack brings with it plenty of silver accents, which help to accentuate the large grille and outrageously large air intakes below the headlamps. At the rear, the saloon’s under-bumper diffuser with drainpipe exhausts protruding on either side seems just – just – on the side of subtlety. The standard 19-inch 5-arm alloys are also relatively discrete, but it’s likely that the even larger options will be popular. 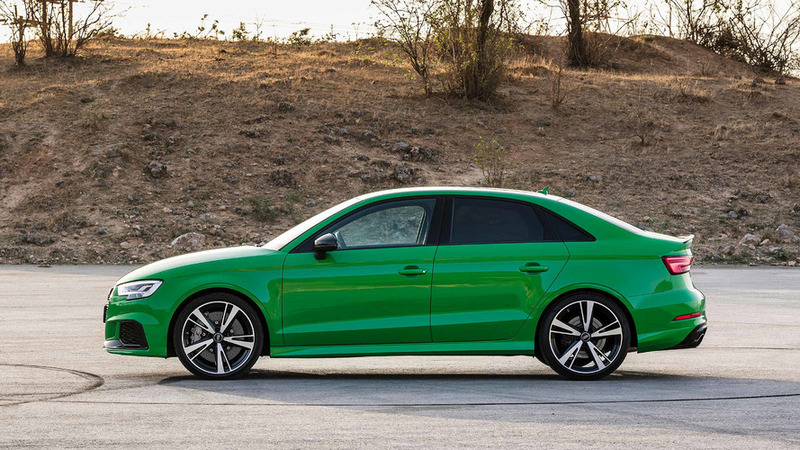 The RS3 has always been the most sophisticated of the three rivals – fast, classy, relatively low on the bling quotient. This is encapsulated in the Audi Virtual Cockpit, arguably the best dashboard display there is on the market today. The special ‘RS Screen’ has a tachometer that dominates with other displays – torque, power output, and g forces – can be configured around it. Virtual Cockpit is a must-have, setting off the rest of the interior in the appropriate manner. The Sportback’s space is as good as any of its rivals, and will take four adults of modest size. The saloon is much the same dimensionally inside, though the boot is very marginally smaller. These test cars are fitted with optional, diamond quilted RS sports seats in fine Nappa leather, which give all the support you could wish for. LEDs deal with all the lighting requirements, allowing an enhanced design of the light glazing as well as improved performance in most conditions, though especially when the visibility is poor. You won’t feel short changed here. The single turbocharger boosts to 1.35 bar, yet there’s little sense of ever being on or off boost, just a solid wall of power right through to maximum revs. Launch control sets the scene. Even though the driver can anticipate the instant rush off the line, passengers get compressed into the seat with a whoop of expletives. 0-62mph in 4.1 seconds says it all. The double clutch, seven-speed S tronic transmission is a great partner to this engine. Lets admit it, Audi is bloody good at fine tuning the dynamic details, so here the shift points always seem sharp and at precisely the right moment, whether you are really on it or simply coasting around town. Paddle shifts are the usual bit of fun when you want them, but, honestly, there are enough options within the drive system beyond the manual control that you can simply stick the shift in Sport and let the computer get on with it. It’s de rigueur to have a sonorous exhaust here, and Audi has an easy job making the RS distinctive. Five cylinders, with a firing order of 1-2-4-5-3, is all you need to build a characterful soundtrack. 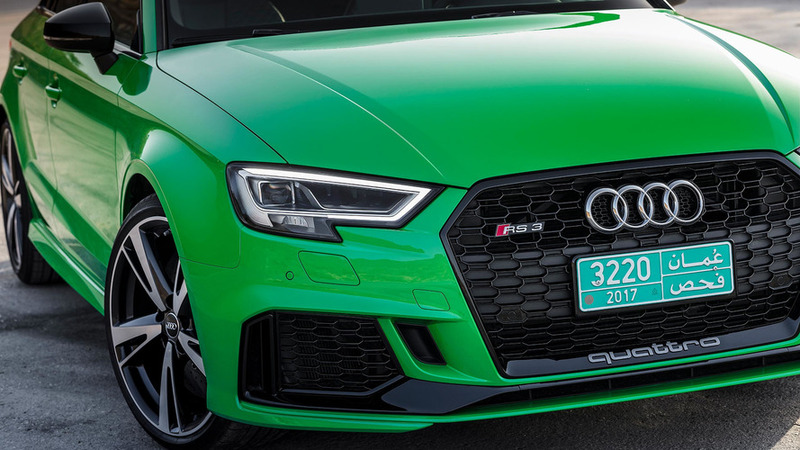 With the exhaust set to Dynamic the sound is simply sublime – standing roadside next to an RS3 driving by at full throttle will send tingles down your spine. In contrast, the A45 AMG is simply loutish. 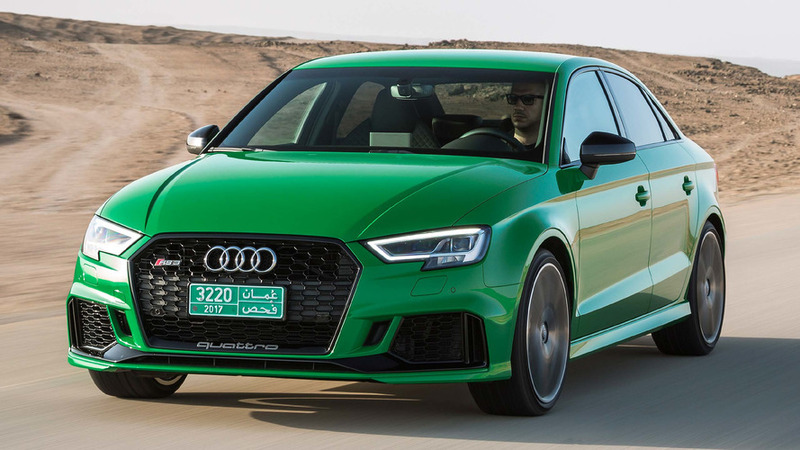 The latest iteration of quattro four-wheel-drive has a lightened multi-plate clutch and torque vectoring capability, with more precision in the way the drive is pushed to the rear wheels. It’s remarkably reassuring, and one of the factors that gives the RS3 its USP – it’s equally good as a city car as it is powering through the mountain curves. That reassurance translates into absurdly fast cross-country ability. Instant pick up out of a corner, lunge along the straight, fadeless braking, then stable through the bends at improbably high speeds. 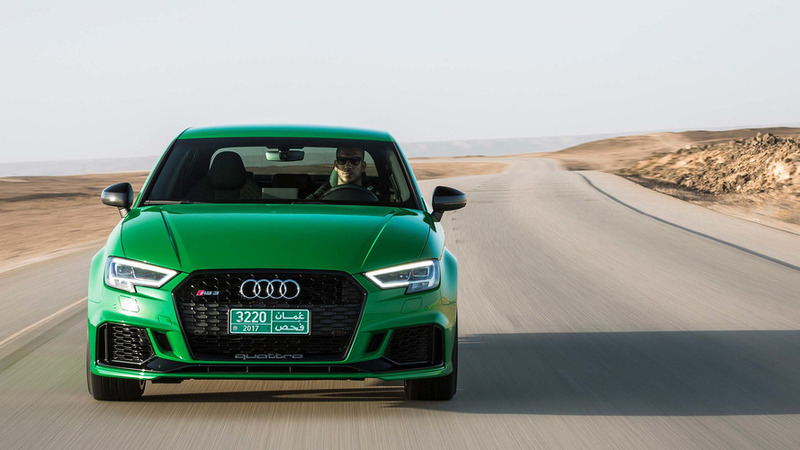 The ESP stability system plays its part here, naturally, but switch it out and the RS3 will shimmy and wiggle its tail like a rear-drive sports car. There are some options here that add a further dimension. Front ceramic brakes bring improved high-speed retardation prowess. Magnetic Ride is a well worth the balance it brings to getting the best possible ride in town combined with agility on faster sections. And you can de-limit the top speed, taking Vmax from 155 mph to 174 mph. You need to be convinced that the brilliant Golf R or Ford Focus RS are simply not good enough for you. 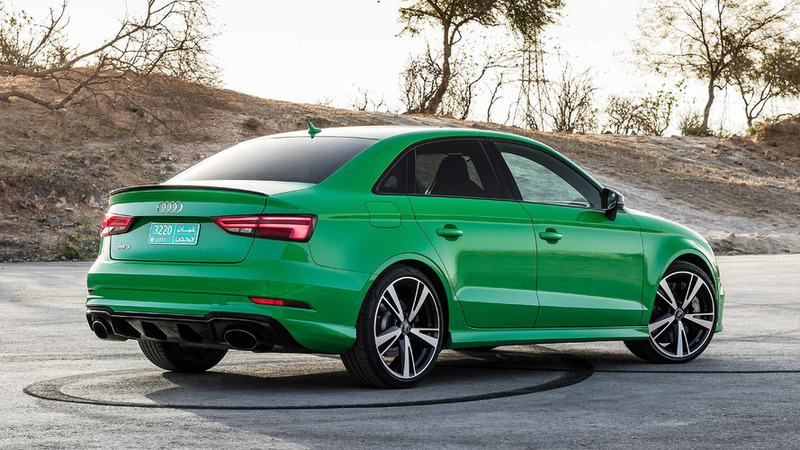 While they may well be, with the Audi RS3 you move into a different dimension of class and perceived quality. And you’re unlike to be disappointed. 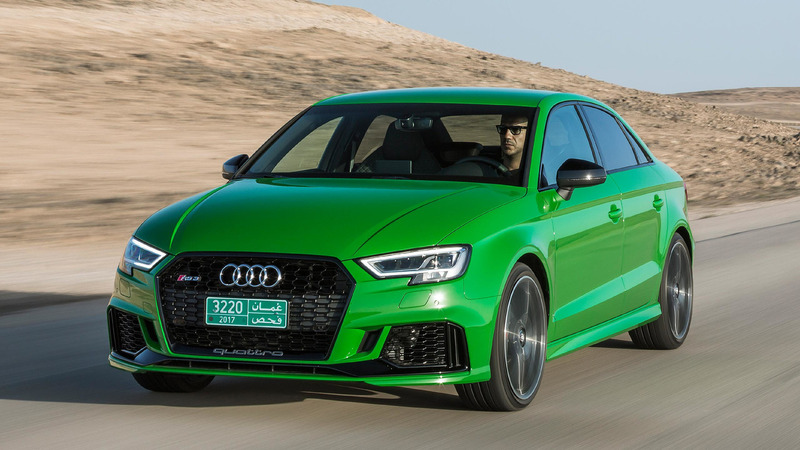 While the RS3 might arguably lack some of the rawness of the Mercedes or the race-track prowess of an M2, it is the best all rounder by some margin. This Audi’s ability to traverse vast distances at very high speed, with reassurance yet, at the same, time much entertainment, is to be coveted. Equally, with the right suspension, you can forget its crushing high-speed ability when you are out shopping or dropping the kids at school. 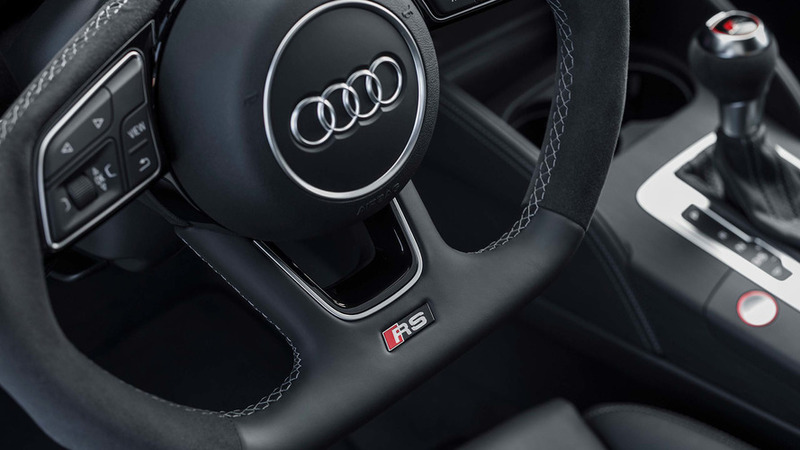 The RS3 is the no-compromise compromise.